For the third time it happened to me again and this time in Le Monde newspaper! 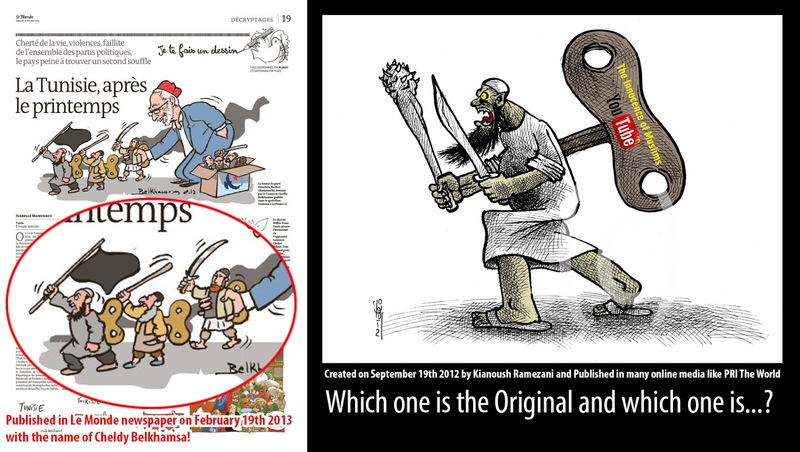 My cartoon (the one on the right side) has been created on 19 September 2012 and has been published in many online media, including PRI The World, my blog, facebook and among Tunisians! and the cartoon on the left side with the name of the Cheldy Belkhamsa has been published Today! tell me which one is Original and which one is…?! and what can we do to stop some “cartoonist” not to steal another one’s idea?